modbargains.com has all of your VW Exhaust needs. Call our Modification Experts at 714-582-3330 today! Every Modification Expert at modbargains is an enthusiast themselves with years of car building experience under their belts. Our experts have helped us put together an amazingly comprehensive assortment of performance parts for a wide variety of makes and models. Using our experience and enthusiasm, we'll help you extract every last bit of horsepower out of your car and since we've built many popular enthusiast vehicles ourselves, we've got the experience to let you know about the VW-specific issues you may encounter and advice you'll only get from another enthusiast. What kinds of Intake System Upgrades are there for VW? When most people think of performance, a high-flow air intake immediately comes to mind for most people. There are several styles of intake available, and you should be aware of what the differences are. Not all Air Intake Upgrades are the same, and some can be used in combination for the most benefit. There are Cold Air Intake Systems, Ram Air Intake Systems, Short-Ram Air Intake Systems and Performance Replacement Air Filters. For more information about Intake Systems, click here. We offer high performance intake systems from the finest names in air induction, including: ABD Racing, AEM Performance, aFe Intake, AWE Tuning, Forge Motorsport, Injen, Neuspeed and Takeda. What types of Exhaust Systems are available for my VW? modbargains offers High Quality Performance Exhaust Systems for VW from Vanguard Exhaust, Remus Exhaust, Active Autowerke, Air Flow Engineering (aFe), AWE Tuning, Billy Boat Exhaust, Borla, Eurojet, Magnaflow, Neuspeed, and Milltek Sport. How can I "chip" my VW? What will an ECU tune do for my Volkswagen? This is a great question, because today's cars complex electronic systems can be upgraded or modified in a variety of ways, sometimes without even needing to physically leave a component installed on the vehicle to have a huge increase in power. Many modern cars, especially turbocharged or supercharged vehicles, can pick up huge power increases simply by changing the ECU software a little. What are Piggyback Upgrades? What do those do to my car? -This sort of system plugs into existing sensors or onto the OEM ECU itself as a physical device. These typically don't directly modify the ECU map parameters but instead somehow alter things like timing and fuel by alternate means. These can typically be installed and removed fairly easily. The Remus Powerizer is a good example of this type of system. These typically offer modest gains at a reasonable price. What will an Upgraded Intercooler Do for my Volkswagen? The intake system of a turbocharged car can seem intimidating but it's not that complicated. In simplest terms, what the intercooler does is that incoming intake air passes through it to reduce intake air temperatures and improve horsepower. 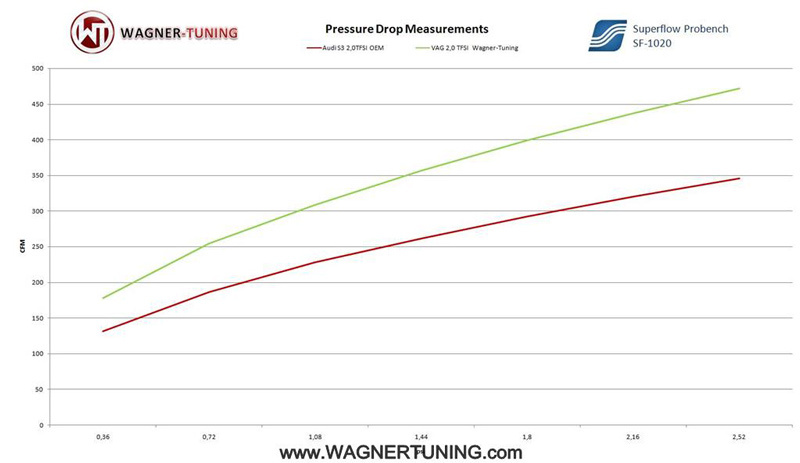 For instance, A Wagner Tuning Intercooler for VW 2.0 TFSI Engines offers 50% more volume than the OEM intercooler and with minimal pressure drop. In the most straightforward terms, a bigger intercooler may only directly result in a modest horsepower gain, but what it primarily does is allow you to make peak horsepower more consistently by keeping air intake temperatures lower. Used in conjunction with other upgrades, an intercooler will allow you to do things like run a more aggressive "tune" for even greater increases in horsepower. If you're looking to increase the power of your turbocharged or supercharged vehicle, a larger volume intercooler is definitely a good idea. We offer Front Mount Intercoolers for VW from Eurojet, Forge Motorsport, Steve Petty Motorsports and Wagner Tuning. What's wrong with my Volkswagen's Factory Intercooler? Many OEM intercoolers are engineered with packaging or cost-saving concerns in mind, which often results in undersized intercoolers being placed in less-than-ideal-for-airflow situations on the car. Many aftermarket manufacturers have stepped in to offer high performance intercoolers that address these issues through the use of things like stepped-core designs or integrating the intercooler into the crash bar to maximize the efficiency of the intercooler. When upgrading the intercooler, you should also strongly consider upgrading the intercooler charge pipes as well. Often, these are a huge restriction and have things like resonators built in which dampen performance. We offer high performance intercoolers from the finest manufacturers including AWE Tuning, Eurojet, Forge Motorsport, Steve Petty Motorsports and Wagner Tuning. What is a Downpipe and what will that do for my car? A performance downpipe is often a re-engineered version of the OEM pipe that eliminates restrictions in the OEM system for enhanced flow. This results in much faster turbocharger spool-up times (less lag), enhanced exhaust sound and significantly improved powerA downpipe is a great bang-for-the-buck modification for most turbocharged vehicles and really unlock the potential of your turbocharged motor. A multitude of manufacturers offer Catted and Catless Downpipes for many turbocharged Volkswagen models. We offer a wide selection of performance Downpipes manufactured to the highest engineering standards, including: Remus Exhaust, AWE Tuning, Neuspeed, Eurojet, Evolution Racewerks and Milltek Sport. What are "Charge Pipes"? How do they improve my performance? Can I upgrade my Volkswagen's turbocharger? Yes, you can. Sometimes at higher power levels, the turbocharger itself becomes a point of restriction. Upgrading the turbocharger will allow your car to step up to the next power level and can increase the overall efficiency of your engine for better power and response. We offer performance turbocharger upgrades that can push a 2006+ VW 2.0T engine to a dizzying 450+whp. What will a Limited Slip Differential do for my car? Well, should you want to go drifting (if you have a rear-wheel-drive car), this upgrade is almost a must. If someone were to tell you all about their experience with LSD, if they're talking cars, they're talking about their differential and not how cool Burning Man was. In simplest terms, for high-power, predominantly FWD vehicles like modern Volkswagens, a limited slip differential will help correct torque steer issues and ensure power is distributed evenly between both front wheels. The differential is a gearing device that helps balance the delivery of power between your drive wheels left-to-right. Without Limited-Slip, under low-traction conditions, power will predominantly go to one wheel - this is most clearly illustrated by a car with an "open" (non-limited slip) attempting to do a burnout. Only one of the wheels will do a burnout - this is called "one-wheel-peel" among enthusiasts. Having the limited slip differential in a rear wheel drive car improves handling performance and also allows you to maintain even grip between the drive wheels for better take-offs. In the case of a front-wheel-drive car, a limited slip differential will help correct the "torque steer" problem that most high powered FWD vehicles suffer from. We offer Limited Slip units from Cusco, Quaife and Wave-trac. What does an Oil Catch Can do for my VW's engine exactly? Many turbo and supercharged vehicles suffer from some degree of oil blowby that enters the intake system. This isn't your fault or because you've somehow neglected your car or that you have a worn out engine (but if you see clouds of blue smoke coming out of your exhaust regularly there may be something wrong), it's just a fact of life. It's going to happen. This blowby oil exits the crankcase vent system as vapor, and tends to accumulate and gunk up the intake system. It loves to accumulate in your intercooler. By installing an oil catch can, you are better filtering the crankcase vent system and catching that blowby oil and keeping your intake system clean. Not to mention, they look cool. They're a great preventative maintenance sort of device. We offer Oil Catch Cans for Volkswagen from Eurojet and Forge Motorsport. How can Heat Shielding help improve my performance? By isolating major sources of heat, you can keep your engine cooler, thereby lowering intake air temperatures, which will always result in the car making more power. Heat shielding can also be used to keep your intake from sucking in hot air or to protect sensitive wiring from extreme sources of heat. What is header wrap? What does that do? Header wrap is a specially designed type of self-adhesive tape that is wrapped around the runners of the exhaust manifold, with the theory being that it improves exhaust scavenging for better performance. Turbo blankets are similar and are designed to isolate the major source of heat to the turbocharger itself and keep the rest of the engine bay cooler as a result. We hope this has helped you better understand some of the types of performance parts that are available on the automotive aftermarket. For specific recommendations for your vehicle, we invite you to talk to our Modification Experts - give us a call at 714-582-3330 or chat with us online at modbargains.com - we are happy to share our passion for cars with you. Our mission is to use our Experience, Expertise and Enthusiasm to make the world a better place for auto enthusiasts. Let us show you what that means to us and call today.